Schertler has unveiled a new version of its acoustic amplifier Unico, with more power, more channels and a new subwoofer. Fender debuts a new series of combo amps for acoustic-electric guitars, which includes two 200W and 160W models. Schertler will be at Musikmesse tomorrow to introduce the successor of its Giulia amplifier for acoustic-electric guitars. AER unveiled a new floor monitor version of its Compact 60/3 amplifier for electric-acoustic guitar, the Compact Slope. 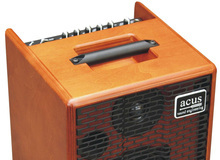 Acoustic has launched a new amplifier for vocals and acoustic instruments. Laney extends its LA and LX guitar amp series with two new models and introduces a new A1 version at NAMM 2014. Along with the Cube GX Series, Roland also introduces a new version of its electric acoustic guitar amp, the AC-40. Ultrasound announced the return of the DS4 two-channel amplifier for acoustic instruments. HK Audio USA, along with Lâg Guitars USA, VOX USA and Korg USA, are giving you a chance to win a live performance setup in a contest.